Eleaf Pico Squeeze 2 Mod, which is powered by 18650 or 21700 battery to fire up to 100W, has 0.49-inch OLED screen to clearly show status of vape. It includes several output modes to deliver different flavor. 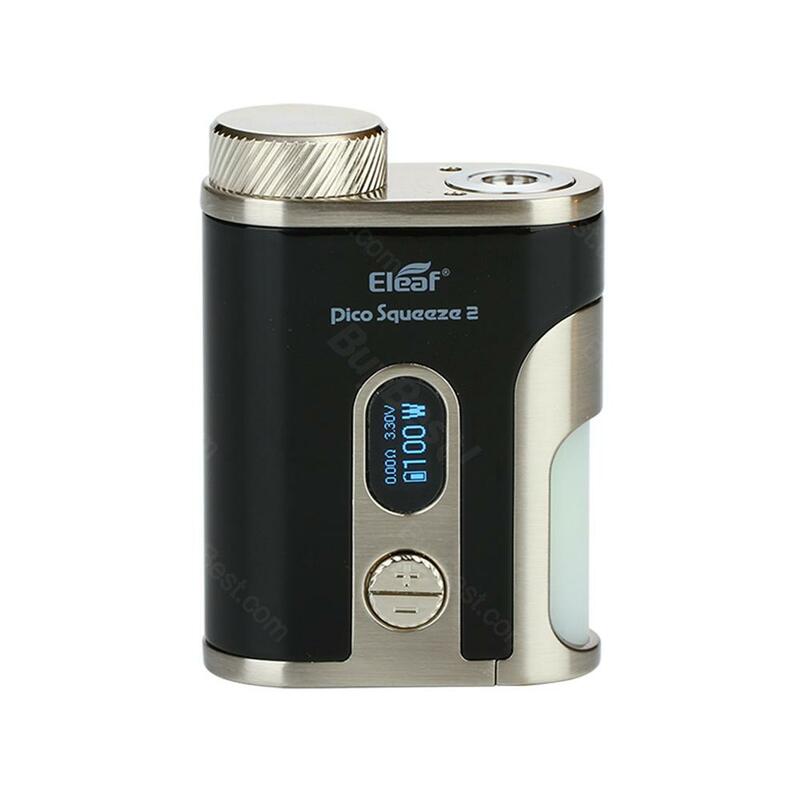 Eleaf Pico Squeeze 2 Mod, which is powered by 18650 or 21700 battery to fire up to 100W, has 0.49-inch OLED screen to clearly show status of vape. It includes several output modes, such as Ni, Ti, SS, TCR, VW and bypass, to deliver different flavor.2A quick charge is helpful for saving your time. Just get this mod with unique appearance and bright color to enjoy vaping. • Three-month warranty for Pico Squeeze 2 Mod. • Quick links:Coral 2 RDA. I broke my mod and here comes the new eleaf mod. Nice squeeze box mod, easy to use and hold. My second mod from buybest, good one. Will recommend. very nice eleaf mod,taste good !Very easy to use!love it and best package ,undamaged. no leakage and big juice capacity, fits me well. This is a good purchase. Will buy again! The mod is very small and fits in every pocket.Love it! Beautiful mod,and i'll buy a good tank to metch it.Thanks buybest give me a good experience. Eleaf Pico Squeeze 2 Mod уточенный и компактный, удобно лежит на руке. Defintely one of my top 3 squonk mod. It's compact to carry around and simple to use. All buttons and the squonk bottle are easy to press. And it has a small screen for data display, that's good. You won't regret with it. led screen i can get the status of vape,eleaf mod never let me down.Pure flavor. I've owned several pico mods, pico dual, pico mega, and pico s, this one is the best. Much convenient with the squonking design. I love the good quality and hand feeling of the istick pico. So when I wanna try squonking, my first choice is this pico squeeze 2 cuz I like it can work with 21700 battery which is better than pico squeeze. The squank bottle is flexible to squeeze. A highly recommended purchase. Very nice small skonking mod. This 100w Eleaf mod certainly can provide u an excellent experience as it can offer diverse flavours. A little heavy but very easy to use!